New Zealand Prime Minister Jacinda Ardern's long-delayed visit to China, which started Sunday, is expected to focus on bilateral and economic trade issues, including speeding up negotiations on the upgrade of the 11-year-old China-New Zealand Free Trade Agreement (FTA) and resolving disagreements over the Huawei case. The visit, also Ardern's first official visit to China since she was elected prime minister in late 2017, could mean a lot for New Zealand, whose relations with China - its largest goods trading partner and second-largest source of foreign tourists - have soured since the country banned Chinese telecom company Huawei from providing 5G technology to a local carrier. It is a good opportunity for New Zealand, which used to be a leader among Western countries in maintaining good relations with China, to repair and strengthen business ties with China, business representatives and analysts said. Speaking to media before her departure, Ardern said that "this is an important visit. New Zealand places a high priority on our relationship with China… Our businesses value the relationships they have and I do look forward to our ongoing engagement." The visit comes following the launch of the delayed 2019 China-New Zealand Year of Tourism in Wellington's Te Papa Tongawera, Museum of New Zealand on Saturday, which was originally planned to take place in February. The delay was claimed to be due to scheduling problems, but still fueled market worries that strained political relations with China could potentially affect New Zealand's tourism revenue. In fact, Ardern's visit to China was also postponed. The trip was scheduled in late 2018. But China withdrew the invitation at that time following strained political ties, and it was only re-issued recently. "Ardern's visit to Beijing sends a positive signal that top officials from both countries are staying in contact to solve major disputes. Communication in the tourism and culture sectors is getting back to normal," Wang Jiazheng, chief representative of the Guangdong Economic and Trade Representative Office in New Zealand, told the Global Times over the weekend. The trip has been curtailed from a three-city visit to one day in Beijing due to the Christchurch mosque terrorist attacks on March 15, media reports said. Analysts said the timing of the visit also shows the eagerness of Wellington to communicate with Beijing and the importance they place on the visit. Industry analysts noted that smoothing the deteriorating economic relations will be the priority for Ardern's visit. In 2008, New Zealand was the first developed country to sign an FTA with China. Since then, bilateral trade between China and New Zealand grew at a rate of 15 percent year-on-year on average, according to the New Zealand China International Trade Association. Due to the two countries' trade structure complementarities, more dairy and agricultural products such as kiwi fruits and avocados from New Zealand are appearing on Chinese dining tables, while the main Chinese exports to New Zealand are electromechanical devices, textiles and clothing, said He Zhiyun, the president of the New Zealand China International Trade Association. In 2018, China became New Zealand largest goods trading partner, customs data showed. "For China, the FTA signed with New Zealand is more of a symbolic meaning, but for New Zealand [whose economy is highly reliant on foreign trade], it is truly a big deal considering the country's small economic size," He said. New Zealand's exports to China now account for about 24 percent of its total exports, far exceeding its export to the US and Australia. 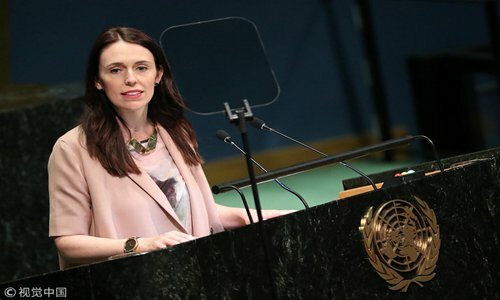 The New Zealand Herald quoted Ardern as saying that progress on the upgrade of the bilateral FTA, which has gone through six rounds of talks so far, are among key areas of focus for her visit. "Detailed key issues regarding intellectual property protection, equal market access on foreign investment and labor rights, areas where the two sides hold differences, will be discussed during the meeting," Yu Lei, a research fellow at the Australian Studies Center at Beijing Foreign Studies University, told the Global Times on Sunday. In addition to the trade focus, the global market is also closely watching over how New Zealand, as a member of the Five Eyes global cyber-surveillance alliance, balances its relations with China under US pressure and whether it will soften its national security-related stance toward Chinese tech giant Huawei's participation in building local 5G networks after the visit. But issues concerning the New Zealand's position in security in the Pacific islands and China's human rights issue could cast doubts on the result of the visit, analysts pointed out. In July 2018, New Zealand warned in a defense report that "China's rising influence in the South Pacific could undermine regional stability," Reuters reported. "It is likely that New Zealand may change its tone this time and instead suggest cooperation on infrastructure projects with China during closed door meetings," Yu said. Before Ardern's visit to China, Human Rights Watch, a New York-based NGO, asked New Zealand's Prime Minister to "publicly express concern" about China's policies in the Xinjiang Uyghur Autonomous Region, according to the NGO's website on Friday. New Zealand has not followed other Western countries to launch groundless accusations or criticism over China's Xinjiang policies in public or on international occasions so far. "New Zealand's approach in dealing with China is wiser and more pragmatic than other Western countries, because it did not let the differences between the two countries interrupt normal cooperation and exchanges," Li Haidong, a professor at the China Foreign Affairs University's Institute of International Relations in Beijing, told the Global Times on Sunday. On human rights issues, not only China, but also many other non-Western countries, hold different understandings and ideas to the West, so Western countries should not lecture others, especially when their human right records are far from perfect, Li said. Human rights issues are normally used by Western countries, especially the US, as a political tool to interfere in non-Western countries' internal affairs, and this is harmful to international relations, Li noted. "China would like to exchange views on human rights issue with others based on equality and mutual-respect, but will not accept groundless, arrogant and biased accusations," Li told the Global Times on Sunday.